The National Museum of Indian Cinema in Mumbai is as expansive as the country’s film industries. A boy spins a charkha while intently peering at a screen before him. He stays rooted to the spot for a few minutes, turning the wheel backward and forward. A few moments later, it becomes clear that he is trying to operate an interactive exhibit. On the screen appears to be a timeline with key dates and information. 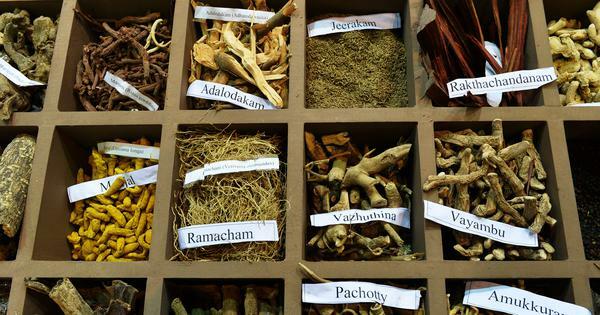 Turning the charkha makes the timeline move. But turn it too much or too little and the words get cut off. A short distance away, Mahatma Gandhi sits still on a bench watching endless loops of the 1943 film Ram Rajya while people line up to take selfies with him. 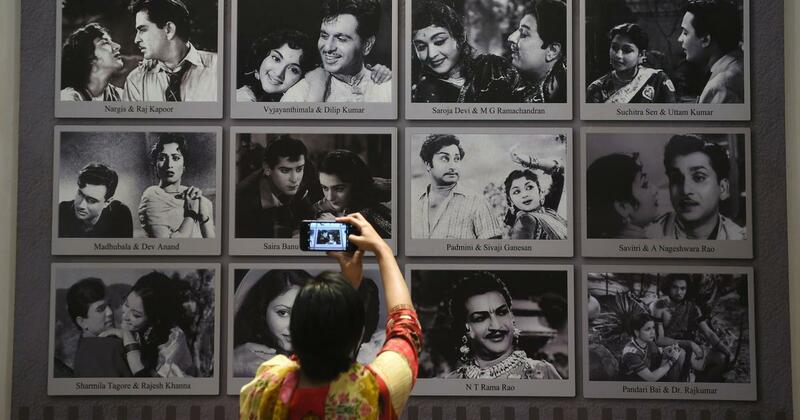 It’s the first weekend after its inauguration and these scenes are from the National Museum of Indian Cinema in Mumbai. 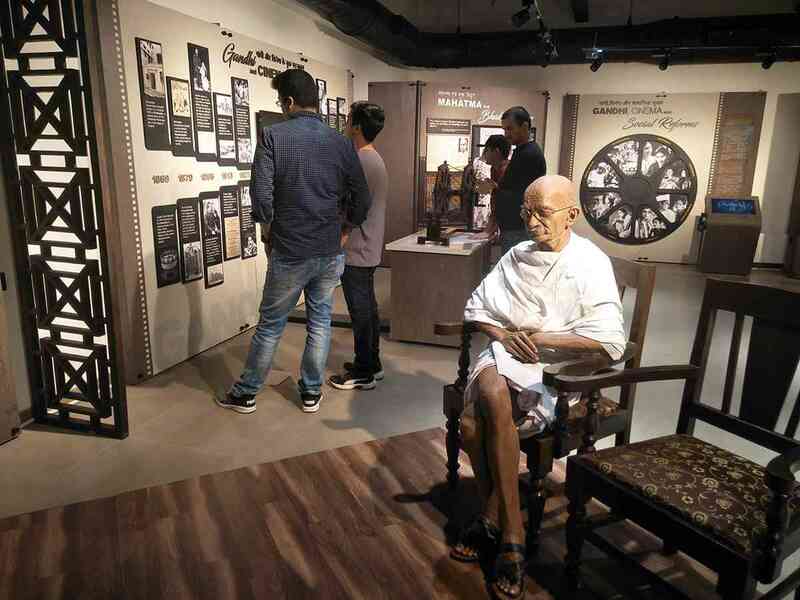 A Gandhi and Cinema section has been incorporated as part of the government’s efforts to commemorate 150 years of the Mahatma’s birth anniversary, but the museum has a lot more to offer. 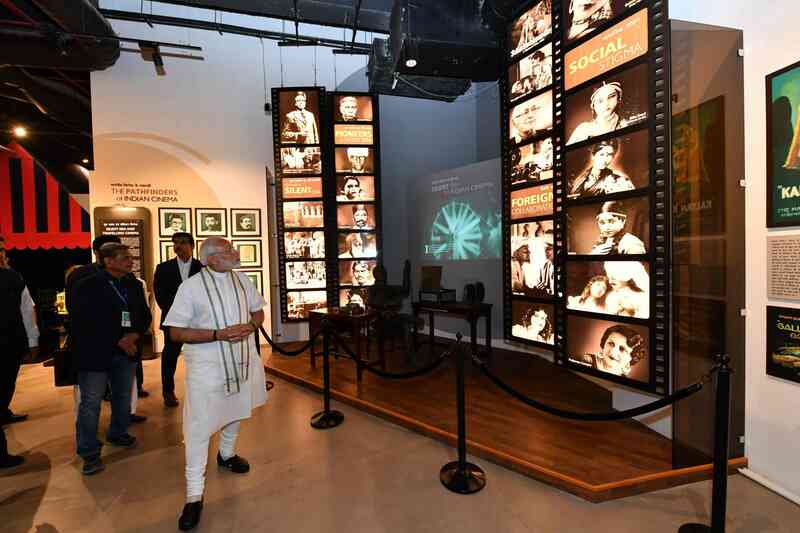 Situated on Peddar Road in the Films Division complex, the museum was inaugurated on January 19 by Prime Minister Narendra Modi, an event that made headlines for his numerous photographs with Hindi film industry celebrities. Conceived in 2003 and built at a cost of about Rs 157 crore, the museum is spread over 9,906 sq m (exhibition area is 2,674 sq m) and represents more than a century of Indian cinema. The Museum Advisory Committee is headed by veteran filmmaker Shyam Benegal and supported by the Information and Broadcasting Ministry. Narendra Modi touring the museum. 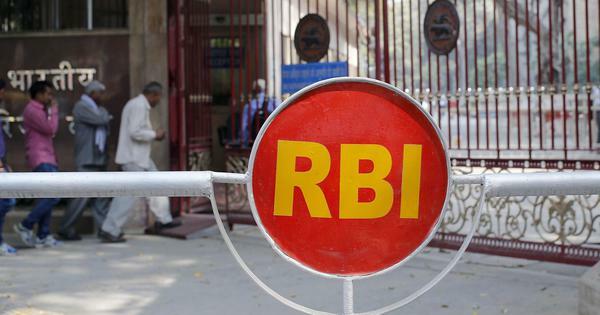 Courtesy Press Information Bureau. The museum is housed in two buildings – Phase I, comprising static exhibits tracing the evolution of cinema, in a 19th-century heritage bungalow, Gulshan Mahal, and Phase II, with interactive galleries – in a swanky five-storeyed structure with angular lines and those tiresome glass facades. Gulshan Mahal was built by Peerbhoy Khalakdina sometime in the mid-1800s. 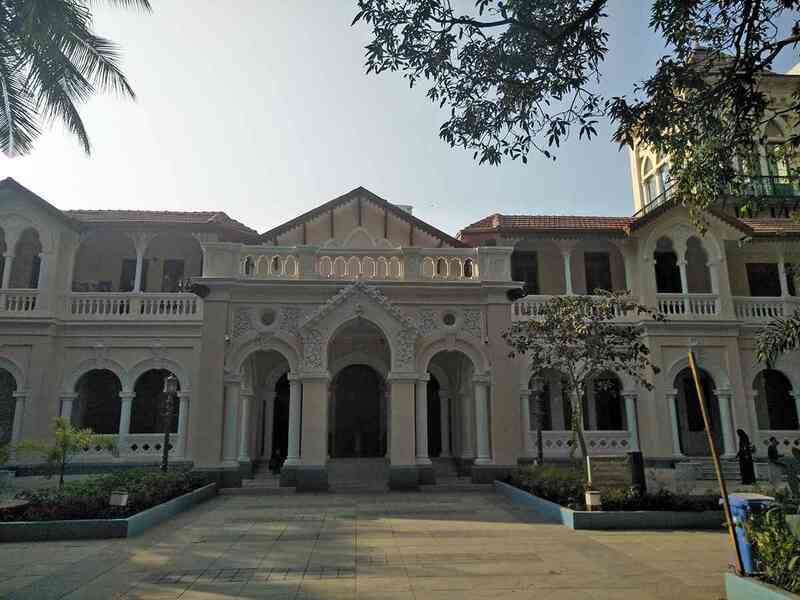 A merchant from the Khoja Muslim community, he came to Mumbai from Kutch in Gujarat with his wife Rehmabai and son, Jairazbhoy, and built this sprawling mansion overlooking the Arabian Sea. A couple of generations and the Partition later, the bungalow was declared an evacuee property and has since been used by the government for various purposes including for shoots (parts of Munnabhai MBBS were filmed here). This opulent Victorian-style bungalow seems awkwardly juxtaposed with the glass-and-steel tower. But the two structures are symbolic of just how far cinema has come in the last century, both in terms of content and technology. Gulshan Mahal, which houses Phase 1. Courtesy Urmi Chanda-Vaz. It is important to start the visit to the museum at Gulshan Mahal, which transposes you to the previous century with its vintage artefacts. Fittingly, the exhibits within its precincts are static like in old museums. In the age of high-tech, and compact phone cameras, it is amazing to see cumbrous and curious-looking instruments like praxinoscopes, zoetropes and mutoscopes that were once essential to filmmaking and screening. Gulshan Mahal features the early history of Indian cinema, starting with that famous first show of the Lumiere brothers’ films at Watson’s Hotel in Mumbai in 1896. It moves on to document the evolution of Indian cinema, from the silent films era to the transition to talkies, the pioneers of filmmaking and its game-changers, including GD Phalke, PC Barua, Satyajit Ray, Ritwik Ghatak and Mrinal Sen. There are eight halls for as many junctures in Indian film history – Beginning of Cinema, Silent Era, Advent of Sound, Studio Era, World War II and Partition, Creative Resonance - Ray, Ghatak, Sen, New Wave and Cinemas of India, about breakthroughs in regional and parallel cinema. Old lobby cards, hand-painted posters, and black-and -white showreels displayed along the halls and hallways are enough to induce nostalgia among even the least enthusiastic among us. The praxinoscope on display. Courtesy Urmi Chanda-Vaz. The new building has its own enchantments, the kind that technology offers. 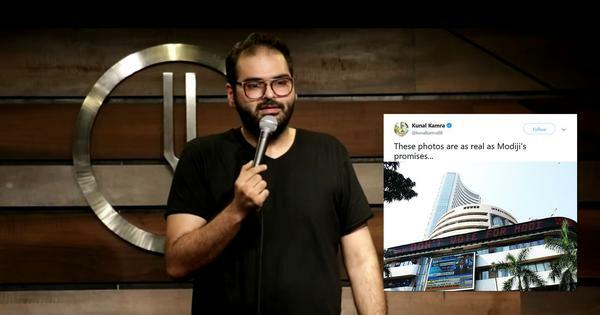 Four exhibition halls – Gandhi and Cinema, Children’s Film Studio, Technology, Creativity and Indian Cinema, and Cinema Across India – and a cafeteria occupy its five floors. Once the visitor has gotten past the Gandhi section, the narrative takes a futuristic turn. 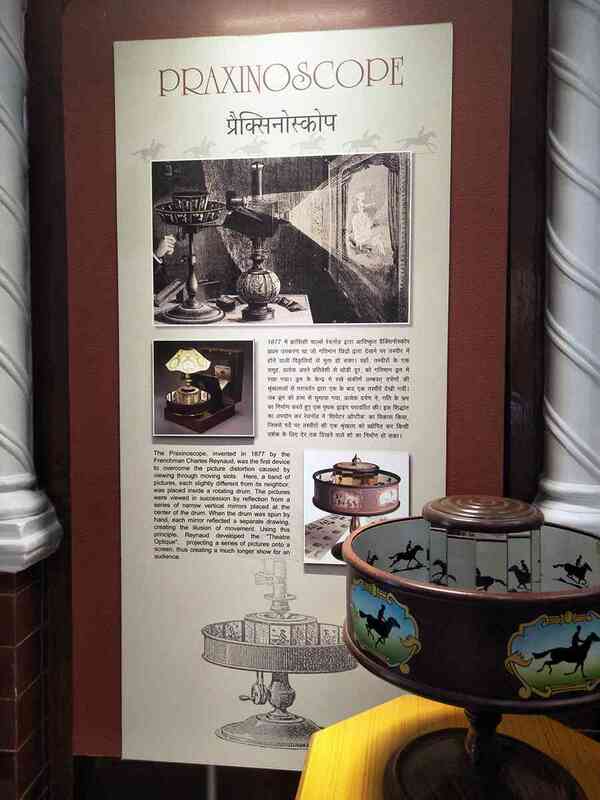 The Children’s Film Studio comprises interactive exhibits (such as the charkha, which is actually symbolic of a projector) that allow children to engage with the process of filmmaking rather than its history. A glimpse at the technical aspects of contemporary cinema is offered simulated set ups that explain chroma keying, stop-motion animation and sound effects and mixing. Level three, with exhibits about technology and creativity, are especially exhaustive and impressive. To see an array of cameras, lenses, lights, mixing apparatus with stories of how ingenious filmmakers and technicians used them to create screen cinema is most fascinating. The origins of techniques that are now commonplace are found in plaques about Phalke’s pioneering animation, PC Barua’s flashback techniques, V Shantaram’s tilted camera shots and Subrata Mitra’s bounce light effect. A production timeline is also useful in understanding just how much work goes on behind the screens before a film is made available to the public. The Gandhi and Cinema exhibit. Courtesy Urmi Chanda-Vaz. The topmost tier, the Cinema Across India exhibit, is the history section featuring great films, artistes and filmmakers – much like in Gulshan Mahal, but more swish. 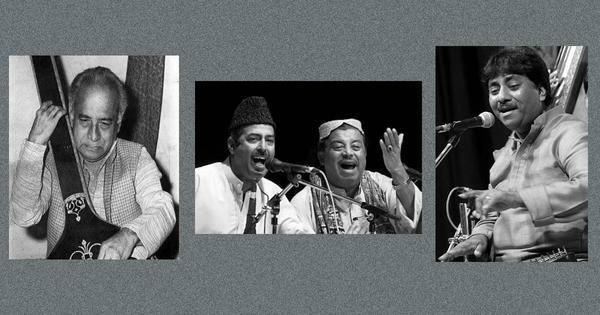 Notable additions include short films and plaques on costume and make-up, film music and dance, film festivals, film institutes and bodies, popular foreign locations, legendary studios, documentaries, the influence of art, politics and literature, certifications and awards. That India’s first film museum should find a home in the entertainment capital of the country is only fair. It may not yet compare with the China National Film Museum in Beijing (the world’s largest at 26,3046 sq m) or its other precursors across the world, but the National Museum of Indian Cinema has plenty of takeaways in terms of art, technology and social history, not to mention the sheer romance of the whole idea. In its many halls, a sombre bust of DG Phalke, a familiar statue of a grinning Raj Kapoor, a large mural dedicated to Satyajit Ray, a huge poster of Madhuri Dixit and even a massive reel pattern on the lobby floor punctuate the museum experience as symbols of what we associate most with and love best about Indian cinema. 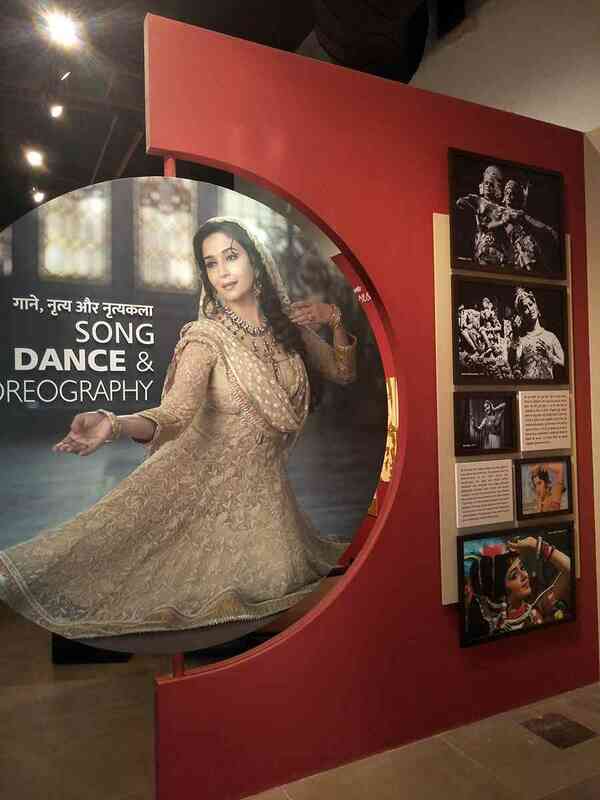 Most poignantly, for many who arrive in Mumbai with celluloid dreams, this museum may be the closest they’ll ever get to experiencing the industry. National Museum of Indian Cinema. Courtesy Urmi Chanda-Vaz. The National Museum of Indian Cinema is open from Tuesday-Sunday, 11am-6 pm. It is closed on public holidays .